The USS Enterprise leaves Norfolk Naval Station in Virginia on its final deployment Sunday. The legendary aircraft carrier USS Enterprise, America's oldest active-duty warship, was steaming in the Atlantic on Monday on the last deployment of its 50-year career. The carrier and its crew of 3,100 left Norfolk Naval Station in Virginia on Sunday in the ship's 22nd deployment. The ship's air wing and other naval staff aboard add another 1,500 personnel. 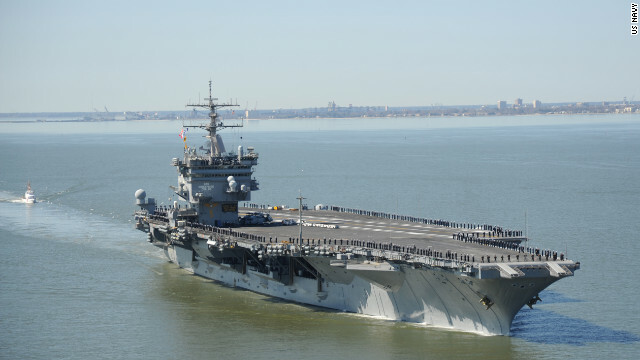 It will be deployed in the Navy's Sixth Fleet and Fifth Fleet areas of operations, which cover Europe, Africa and the Middle East, including current hot spots Iran and Syria. "Enterprise is as ready and capable as she has ever been throughout her 50 years," the ship's commanding officer, Capt. William C. Hamilton, said in a statement. "The ship and crew's performance during work-ups demonstrates that the world's first nuclear-powered aircraft carrier has never been more relevant." Nicknamed the "Big E," the Enterprise, CVN-65, is the eighth U.S. Navy vessel and second aircraft carrier to carry that name. The first carrier Enterprise was built in 1937 and was one of only three carriers built before World War II to survive the conflict. That Enterprise was decommissioned in 1947 as the most decorated warship in U.S. naval history. The current Enterprise, at 1,123 feet the longest ship in the U.S. Navy, saw its first action 11 months after its commissioning, when it was to dispatched to enforce a blockade of Cuba during the Cuban Missile Crisis in October 1962. It participated in strikes on North Vietnam in the 1960s and '70s. In 2001, Enterprise was one of the first ships to respond to the September 11 terrorist attacks, as its warplanes dropped 800,000 pounds of bombs on Afghanistan during Operation Enduring Freedom, the Navy said. The ship was the star of the U.S. Navy for many of its 50 years, and that included a role in "Top Gun," the 1986 Tom Cruise movie about naval aviators. "The crew is very mindful that we are following the legacy of the more than 200,000 sailors who have come before us during the last 50 years," Hamilton said in a statement. "It's the sailors of this great warship, and the sailors that have served aboard Big E over the past half-century that have established the legacy she enjoys." The 95,000-ton ship is to be deactivated in Norfolk on December 1 and decommissioned once all reusable items are removed, Ensign Brynn Olson, the ship's deputy public affairs officer, said Monday. The ship will then be towed to Washington state for scrapping, Olson said. What the Enterprise will not become is a museum, she said, because removing its eight nuclear reactors will involve so much destruction that the ship could not be repaired to museum quality. "It would just be too expensive to put her back together," Olson said. Whether there will be a ninth USS Enterprise remains to be seen. There are several active online petitions to get hull number CVN-80, the third in the Navy's new Gerald Ford class of carriers, named the Enterprise. That ship is planned to be commissioned in 2021. "There is no U.S. Navy without a USS Enterprise," one petitioner wrote on epetitions.net. Said another, "Every Navy needs a flagship, and the U.S.S. Enterprise should be ours! There must and will always be a ship named Enterprise." With the obvious change in our coastal weather system wouldn't it make sense to convert Enterprise from a military ship to a rescue center? Imagine using her size as a shelter for displaced citizens with her ability to house people on her hanger deck and crews quarters. She could assigned to cities that need power with her nuclear reactors supplying power to cities that lose power to hurricanes and storms. And her kitchens are legendary for their ability to produce thousands of meals per day. Inn addition her flight decks could be utilized for landing rescue helicopters.Imagine had she been available for the citizens of New Orleans or New York. It would seem a more fitting end for a still valuable ship. Let us make sure history never forgets the name ... Enterprise.